Two bifolia from a blockbook. Woodblock print on paper, printed on one side of the sheet only. Watermark: hunting horn, similar, but not identical, to Piccard III, 279. 270 x 195/390 mm. 4 leaves: ff. 17-18 and 19-20. Two bifolia from a blockbook in Latin, Schreiber’s edition III. – Blockbooks are characterized by a close relationship between images and explanatory texts, as both were cut and printed from the same wooden block. This technique was especially used for popular religious literature of an edifying and moralizing kind, such as the Biblia pauperum, the Ars moriendi, the Apocalypse, etc. The Biblia pauperum represents the typology of the Middle Ages. Subjects from the Life and Passion of Christ were compared to Old Testament events and provided along with a witness from the prophets. The manuscript tradition of this picture text goes back to the 13th century. Shown here, for example, is f. 18/s: (centre) Last Supper, (left) Melchisedech offers wine and bread, (right) Moses and the Israelites gather Manna. Whereas the woodblocks were definitely cut and probably printed in the Netherlands, the striking colouring of our bifolia points to Germany, especially to Ulm, where single sheet woodcuts were painted in similar red lake, yellow ochre, and bright green. 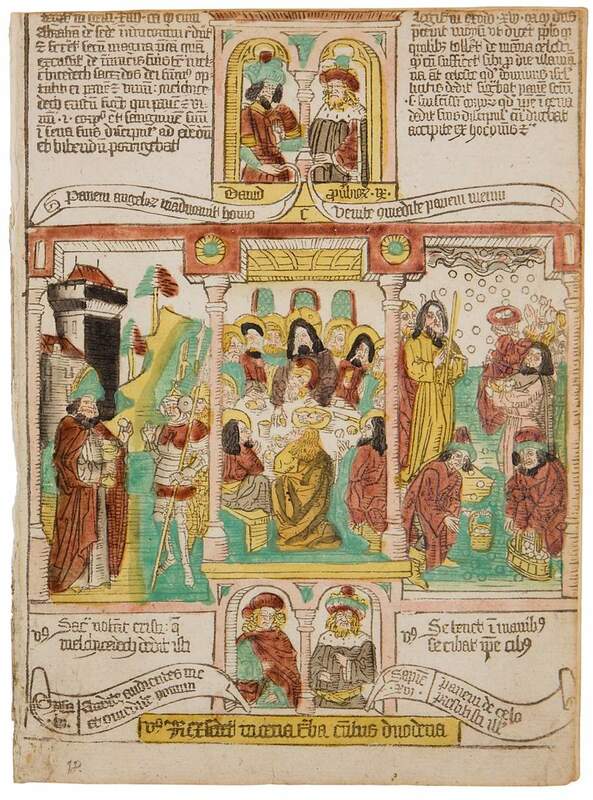 The blockbook was probably coloured after it reached the monastery of Wiblingen (near Ulm). This provenance is documented by another fragment that is preserved with its original flyleaf and ownership inscription. Extremely rare, as are all blockbooks.